on July 21, 2017, 3:44 p.m.
Qoo10’s founder and CEO recently outlined his hope that the firm will establish itself as one of the top four e-commerce players in Asia. The platform, initially seen as a market outsider, has made remarkable progress in recent years and has now set its sights even higher, hoping to increase its gross merchandise value by 50% in this year alone. The marketplace has become even more competitive of late, with speculation that e-commerce behemoth Amazon will launch in Singapore and Malaysia this year, threatening other companies’ market share. This makes Qoo10’s targets all the more ambitious. But is it up to the challenge? BrandIndex data provides some insight into how Qoo10 might fare. 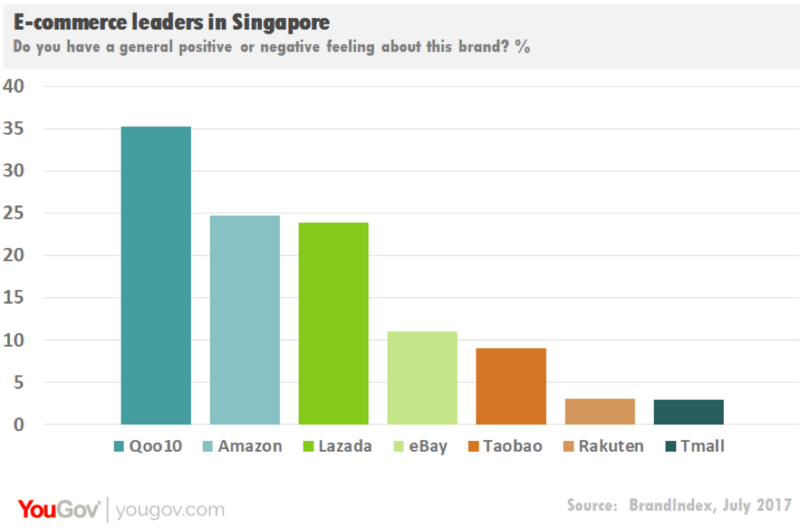 Looking at Impression scores – which gauge whether consumers have a positive or negative view of a brand – Qoo10 towers above of its competitors in Singapore; its score of +35 is well ahead of all the other seven e-commerce brands currently tracked in Singapore. Qoo10’s closest competitor is Amazon, which scores +25, followed by Lazada with +24, eBay (+11) and Taobao (+9). 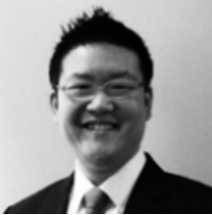 This puts Qoo10 in good stead in one of Southeast Asia’s most competitive e-commerce hotspots. But looking beyond Singapore, the brand still has a long way to go. Comparing purchase intent year-on-year across four markets, Qoo10’s doesn’t seem to be making the gains with consumers it will need to in order to keep pace with its target. While Singapore continues to be a strong market for Qoo10 in Southeast Asia, purchase consideration in Indonesia, Malaysia and Thailand hasn’t grown considerably over the past year. 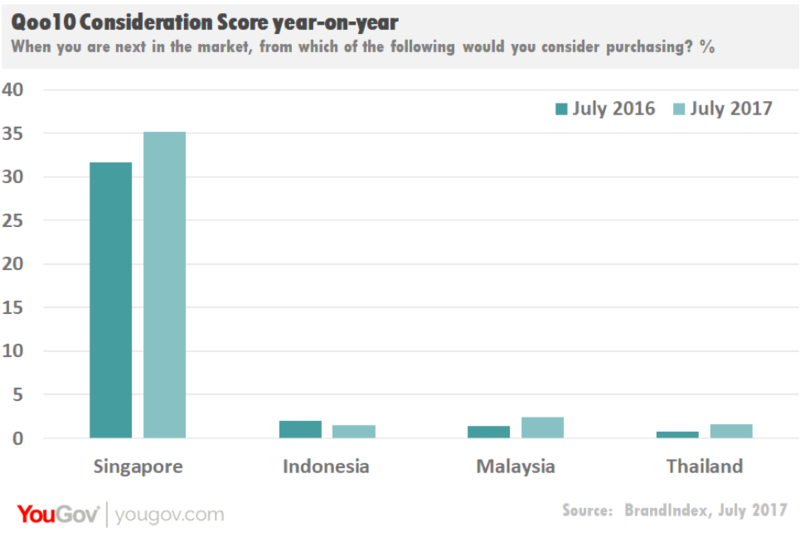 Looking at Consideration scores Lazada, one of Qoo10’s e-commerce rivals in Southeast Asia, it becomes all the more clear just how much work Qoo10 still has to do in emerging markets. 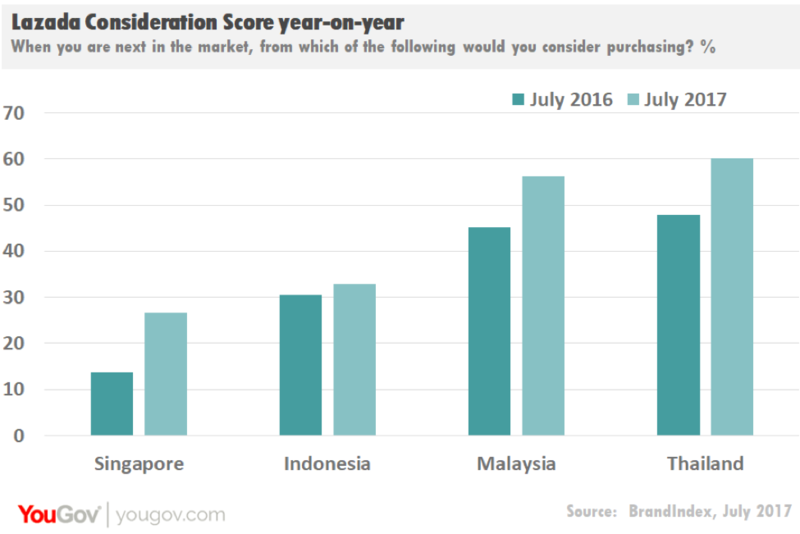 Lazada has seen an increase in consumer purchase intention in all four markets, doubling its Consideration score in Singapore over the past year. It has also seen considerable growth in Indonesia, Malaysia and Thailand. Though there is huge potential for expansion within all these markets, Qoo10 may need to whet consumers’ appetites a little more before it can move its appeal beyond its Singapore base.